Austin, TX – November 2, 2010 – Global touch screen manufacturer, Touch International, and German-based touch screen distributor, Zabel, announced their partnership today to exhibit Touch International’s Multi-Touch Resistive (MARS) Technology at Electronica 2010 in Munich, Germany, November 9-12. 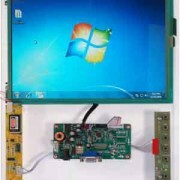 Available for demonstration at Electronica 2010 in booth 253, hall 5B, this multi-touch resistive technology is offered in a 10.4” developer kit which allows users to test-drive the technology and streamline the product development process. Featuring superior drift-free performance and a fast and accurate response time, the MARS developer kit supports up to 10-finger touch with true touch gesture and palm rejection. Accepting input with bare or gloved fingers and any pointing device, this multi-touch technology is ideal for applications in the military, aerospace, industrial and retail fields. For more information about the Multi-Touch Resistive touch technology, visit the MARS information page. For more information about Electronica, visit http://www.electronica.de/en/home. Founded in 1973, Zabel-Technik GmbH specializes in the development and sales of “man-machine-interface” products including keypads, switches, touchpanels, and display systems. Products range from complete subassemblies and include the design, housing, electronics, and displays. Zabel-Technik employs a highly trained technical staff, to assist customers with custom design concepts and convert them into finished products. Touch International, headquartered in Austin, Texas, was founded in 2002 by Michael Woolstrum and long-time veteran, Gary Barrett, the company’s CTO. TI has become a world leader in touchscreen, EMI filter, and enhanced display technology. The company operates its engineering and design facility and corporate headquarters in Austin, Texas as well as a high volume production facility is located in Shenzhen, China.